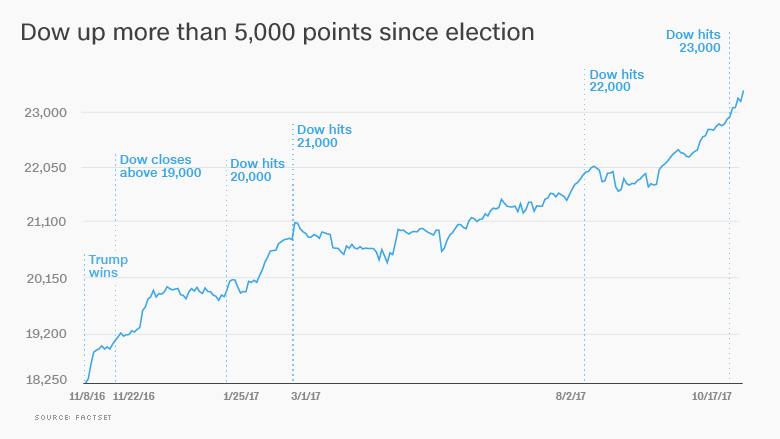 Just a week after blowing past 23,000, the sizzling Dow is halfway to its next milestone. The Dow zoomed nearly 200 points to a fresh record high on Tuesday thanks to impressive earnings from the likes of Caterpillar (CAT), General Motors (GM) and 3M (MMM). Investors are celebrating the latest evidence that Corporate America is very healthy. That put the Dow close to 23,500. But is Wall Street celebrating a bit too hard? Some market pros are growing concerned that stocks are too expensive. Goldman Sachs crunched the numbers on virtually every way to value stocks and found that S&P 500 stocks have rarely been as expensive as now. The most popular way to value the stock market is based on projected earnings over the next year. By that measure, known as forward price-to-earnings, the S&P 500 is trading at a lofty multiple of 18.5. That's miles ahead of the long-term average of 12.8. More telling, over the last four decades, stocks have been more expensive only 11% of the time, Goldman Sachs analysts said in a recent report. Digging deeper, the report found that the median stock in the S&P 500 has a forward price-to-earnings ratio of 18.7. That's higher than 98% of the time. A variety of other measures confirm that the stock market is trading in truly rarefied territory, Goldman found. For example, the median S&P 500 stock has never been more expensive based on enterprise value to sales. Enterprise value is roughly what a company would be worth if it were acquired. Ditto for another another measure based on how fast profits are growing. And other metrics cited by Goldman are either at all-time highs or very close. In other words, there have been few times in history where the stock market looked this expensive. By some measures, it never has. "Objectively, the stock market is overvalued. That's a fact," said Peter Boockvar, chief market analyst at The Lindsey Group. There's only one measure Goldman Sachs listed that makes the market look a bit inexpensive: a gauge of a company's financial strength called free cash flow yield. The S&P 500 is trading at about average levels by that measure. But Goldman notes that metric has been kept low because companies aren't spending a lot on factories and equipment. Of course, there are plenty of reasons why the market is on fire. The U.S. economy looks solid, with unemployment at just 4.2%. Virtually all major economies around the world are finally growing at the same time. Inflation is unusually low, allowing the Federal Reserve to keep interest rates very low, for now at least. And Wall Street is getting excited about the tax overhaul proposed by President Trump and Republican leaders in Congress. "The speed the market is moving with is surprising. But the fundamentals support higher stock prices," said Terry Sandven, chief equity strategist at U.S. Bank Wealth Management. Given that bond prices are also very expensive, Sandven said investors have few good alternatives to stocks. Consider that one-third of the S&P 500 pays a higher dividend rate than the 10-year Treasury yield of 2.4%. Market bulls argue that expensive valuations might not matter right now. Sandven said that while valuation metrics would "suggest caution," history shows that "stocks can be over or undervalued for long periods." Even market bears acknowledge that valuations don't matter, until they do. "Valuations are never a timing mechanism. Markets were expensive in 1996," said Boockvar, referring to the period before the dot-com bubble popped. "Elevated valuations suggest low long-term returns," Goldman Sachs wrote. Sandven agrees, saying investors should expect annual stock returns in the mid-single-digit range. That would be disappointing compared with the double-digit gains of recent years. The S&P 500 is already up 15% this year. 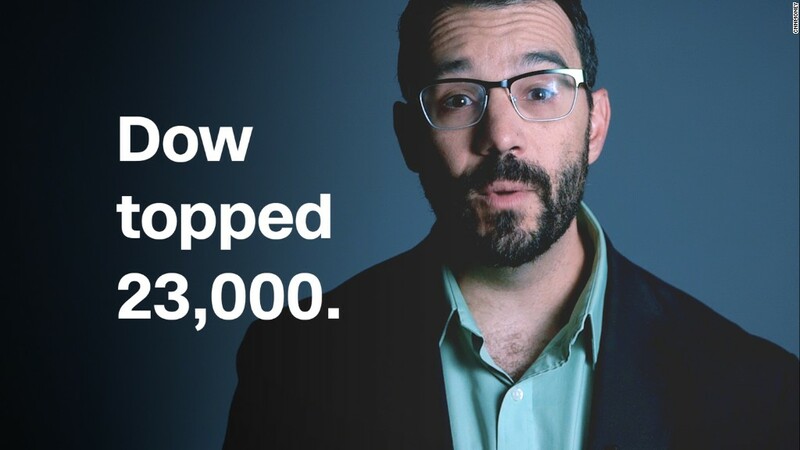 In other words, if you're jumping into the stock market, don't bank on these incredible returns to continue.